What is it about: It’s a story of a policeman, who loses his dear ones due to his straight forward approach to the criminals. Post which he decides to live a peaceful life with his beloved daughter. What breaks the peace in his secluded life forms the crux of the story directed by Atlee. 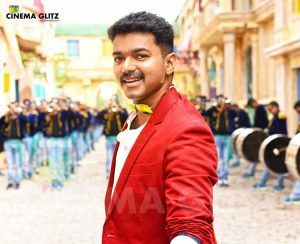 Why it’s disappointing: I won’t ponder too much on the disappointing factors in THERI. Because it’s a film which is released during festival season and one which was due for some time this year. But Atlee gets away this time, only because of Vijay. If someone else would have done the role of “Vijay Kumar”, this film would have gone in to the drain. The film starts off with a great promise but dulls after 30 minutes in to it with melodrama, sentiments and a draggy flashback. I agree these are ingredients of a masala entertainer, but there was no new treatment to it. Post interval the film rushes in to clichés and is in a hurry to avenge the first half. Atlee tries to make up for the draggy first half. But in that haste, he leaves too many traces, which blindly tries to fall on the shoulders of Vijay. That becomes little too much for Vijay to carry around, which in turn tires out the audience. There was too much energy inside the cinema hall, mainly because of first day first show. The excitement will fall short as the time goes by. Atlee as filmmaker has to put in more soul, this formula might not work every time and he might not get this lucky all the time. What to watch out for: The film had a great actor in the name of Nainika, she was a darling, and definitely the darling of the masses after THERI. In the first 30 minutes she shadows Vijay. She has an amazing charm, which demands unconditional love for her. She was delectable for her age and her dialogue delivery was impeccable. Every scene involving her was a delight to watch. She’s the one and only THERI BABY, an absolute doll who proved that acting is in her genes. Vijay did a great job, he did his best to carry this film forward with his charming personality. He looks great in every frame, after “Nanban” this will be a sober intro for him, which I loved the most. An intro without noisy song sequence followed was not present in THERI. At places his performance seemed a little overboard, but he managed to balance that with the mass factor. Overall a commendable performance. The leading ladies did their job quite well. Samantha was a pretty fit and for once I felt she didn’t seem fake. And gave a sweet performance. The chemistry between Vijay and Samantha was really good on screen. Amy Jackson lip sync has improved to a great extent and in this one she’s got a bit of Malayalam to cover too. Rajendran had quite a meaty role in the film, usually he will disappear after few minutes in to the film. In this he appears for quite long and did a great job. Mahendran sir, was something new we got to watch and he was great. He fit the bill, and did the job with ease. In few scenes he brings a great character to the role. The cinematography was great by George C Williams, he’s a great pillar of strength for Atlee. He made Raja Rani Look astounding and now THERI. The film was cut well by Anthony L Ruben. The action of the film was unlike other Vijay movies. It had a class and was choreographed well. Especially the climax sequence. The music of the film seemed good with the visuals, but as an album it didn’t have the punch. GV 50 fared pretty well. The art direction was great and neatly supported by VFX team, at places it looked quite excessive, but manageable. Verdict: Atlee as a filmmaker needs more soul, just one “Raja Rani” will not save him every time. But he knows the pulse of the general audience, which saved him in THERI. He executed the film in a musical wave which goes up and down, doesn’t have a grip which it could hold on to. At the end of the day, he delivered a film which will definitely satisfy the fans, who were hurt by “Puli”. But the rest might sail through, can watch this film for Vijay and Nainika’s delectable chemistry. Vishal’s Irumbuthirai to finally release on May 11!